one of the best comfort food i have ever known would be chicken sopas, some may call it chicken soup; but the effects after scooping in a hearty spoonful into your mouth feels like the most comforting hug your mom ever gave you. what i learned from my mom so that the noodles won’t get too soggy and big after cooking them is to add the raw noodles while sauteeing the chicken, garlic and onions. i’m not much of a tea drinker, when i first heard of green tea and had a taste of it, it was dislike at first taste. i didn’t know at that time that green tea can be infused with other flavors. another tea drink i never had love at first taste was milk tea. i’m blaming the british for this, tea mixed with milk was just off. but then, i changed my mind when i was introduced to those milk tea kiosks found all over the metro. (milk tea is the new froyo). and what a pleasant surprise that a small kiosk opened here in the office canteen. called “infini-tea”. so i gave it a go. i tried their hokkaido milk tea with pearls but failed in comparison to Serenitea. taste wise, it was ok, but what threw it off the bat was the pearls. it was a mess, it didn’t blend well with the milk tea and it had this weird after taste. so the next time i ordered the hokkaido, i took out the pearls. another discovery and growing addiction is their fruit teas. they use green tea as the base and add flavors. of course i had to try and loved up to this day their lychee fruit teas. i’ve been ordering it everyday since last week. i think choosing tea drinks over the usual sodas is the best option. and i heard about the benefits of teas in the body. so, there’s nothing to lose. and i’ve sort of given up sodas. i can’t even finish a glass of it, unlike before. so, yay for healthy choices! it’s no doubt that my family loves chicken. fry it, add soup and noodles to it, bake it etc. as long as it’s chicken, we’re up for it. 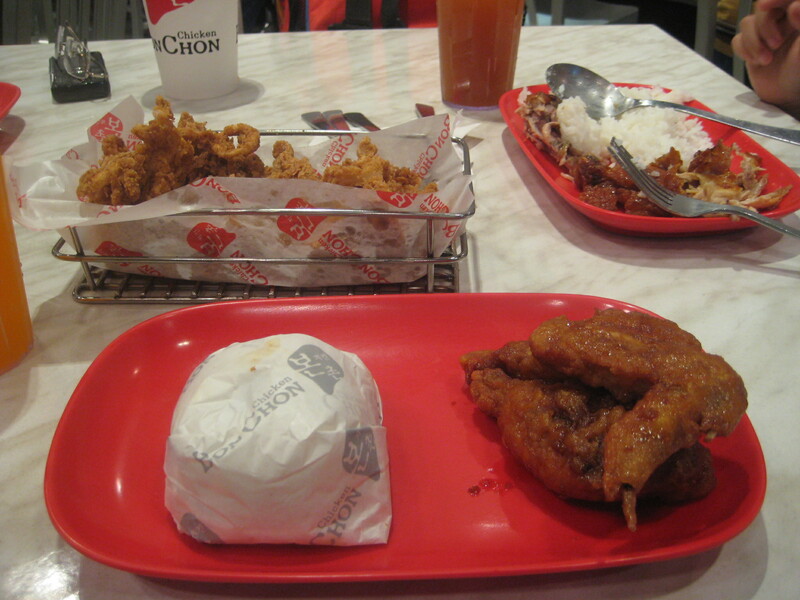 i’ve been hearing about people raving about Bonchon Chicken a few months already, and finding out hubby’s basketball team is called, Team Bonchon, i guess it’s a sign to finally try it out. 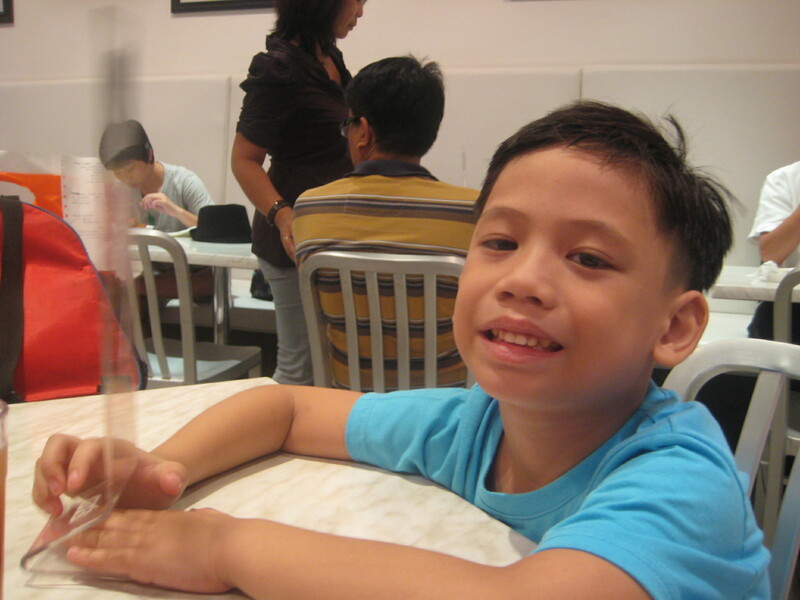 so one weekday, hubby, K1 and i trooped to greenbelt 1 after shopping for K1’s things. it was love at first bite. the skin was crunchy all throughout. we ordered the soy chicken, hubby tried the spicy variety. according to him it wasn’t that spicy. can’t blame him, he has chili sauce flowing through his veins. so what’s not spicy to him may be the right kind of spice to some. 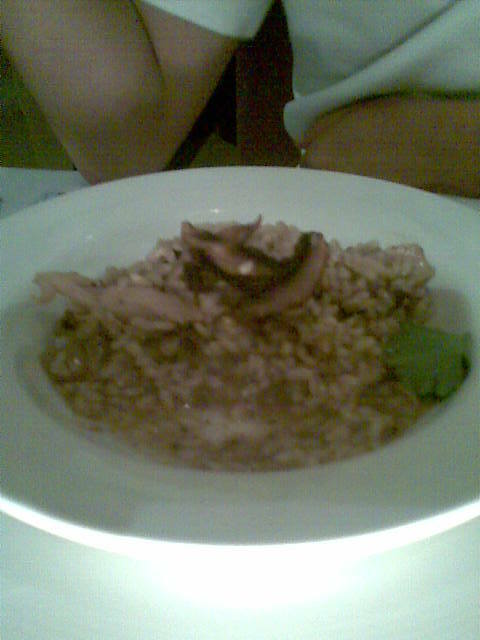 the chicken meat itself was juicy and tender, but i was hoping that the same taste of the skin would seep in to the skin. but over all, it was a delightful meal. 2 pcs of either wings or drumstick wouldn’t be enough so i suggest to order the 6pcs instead of the rice meal. 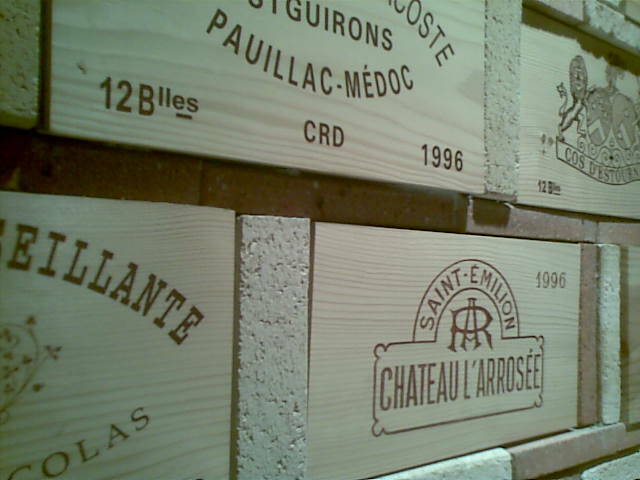 (we were playing safe that time since it was our first time, now we know what to order the next time we drop by). as for k1’s review, he loved every bit of the chicken! this is a kid’s dream come true for fried chicken! i’m sure my boys would love to eat here. 🙂 he also enjoyed the squid which he’s still in denial that what he ate was indeed squid. he still insists it was chicken, chicken popcorns what he said. the greenbelt branch wasn’t that big though, so big families like us would feel a little cramped and kids under the age of 5 would have a hard time “roaming” around. but hey, there’s the take out option or head over to their ayala triangle branch and have a picnic with the family in the park. overall, my family and i would definitely come back here. since it’s the summer months and people are getting ready to show off their beach bodies, why not attempt to join the crowd? i’ve decided to skip rice all together, i’ve avoided rice during dinner for quite a while now so why not avoid it during lunch as well? so far, i’ve been “coping”. especially with the yummy “lutong bahay” viands here in the office canteen. can’t see any results yet since i’m on my 5th day of avoiding rice. so far, i’ve been experiencing slight withdrawals and cravings but i have to resist. what i do, i stock up on more fluids, especially water. but i’m quite enjoying lunch since i get to eat more veggies (hello chopsuey!) and fish. i don’t consume meat (beef & chicken) that much, since fish dishes have been more appealing to me lately. i’m not ready yet to weigh myself for the fear of being disappointed still looms. we’ll see after 2 weeks (our upcoming family beach trip). i’m also looking forward to wearing my two piece suits again. hopefully by that time, my tummy has significantly decreased in flabby-ness. but hey,i’m still willing to risk it since this belly has held 3 precious kids for 9 months. hubby and i had an impromptu dinner last night. he had been intrigued by the restaurant for quite some time. and last night, he couldn’t contain it any longer. we decided to try it out. i warned him that the place looks like a fine dining place. and it was. we were the only customers last night. so all the attention was on us. 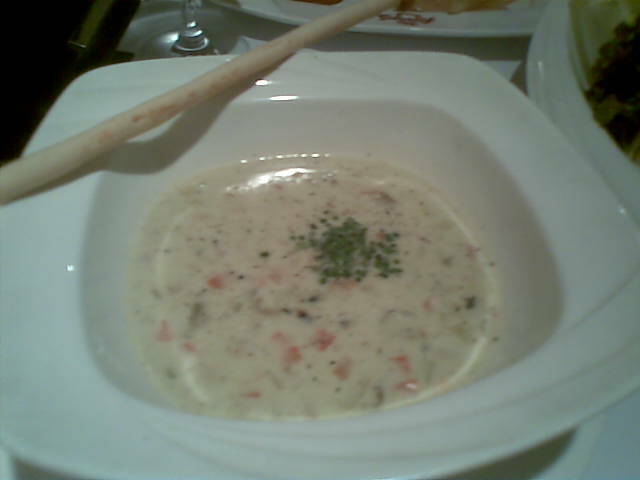 hubby and i ordered: clam chowder for the soup. because all our meals, soups are required. we also ordered their shrimp salad. which was a bit of a disappointment since there were only 3 pieces of shrimp in the salad. i also enjoyed the asparagus, which again, were only 3 stalks. it was a small serving of salad placed in a big serving dish. 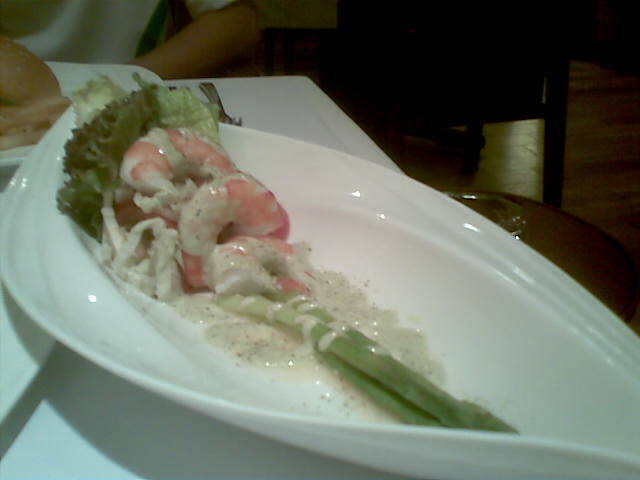 see the 3 pcs of shrimp? 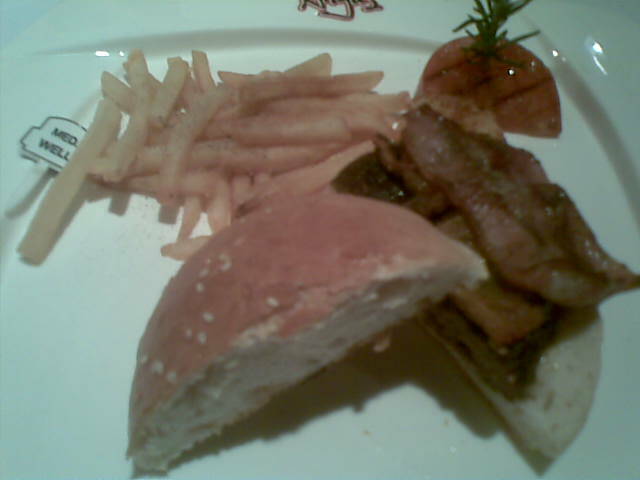 and for the main course, hubby and i ordered the angus burger. we requested to have the burger split into 2 (because we love to share our food hehe). bad move since we were charged extra P80.00 for splitting the burger. 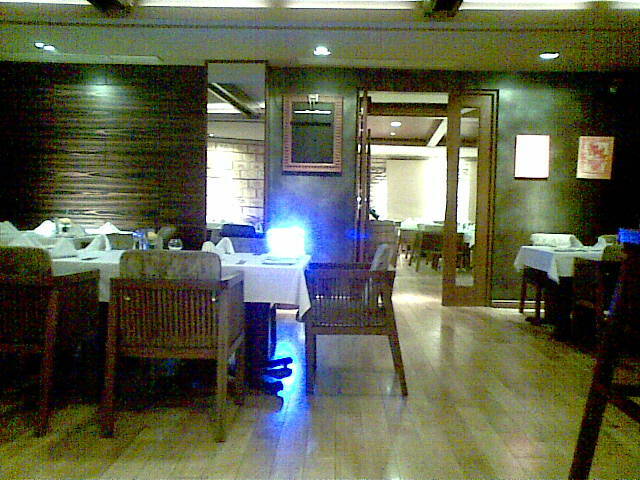 over all, it was a pleasant experience if not for the price of the food. but you can’t blame the place since they serve angus beef flown in from the US. total bill was around P 1500.00 plus vat and service charge. 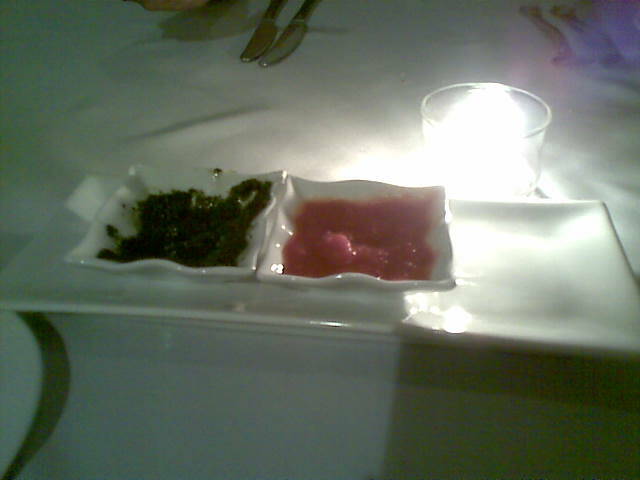 One night after Plana Forma class, hubby and i tried out this resto near our house. I was craving for some good Italian food. We went there without any expectations. We thought it was the usual Italian dinner place. It wasn’t, it was more than that. It was more of a fine dining place. And we were a bit underdressed. Thank goodness it was late (around 10pm) so the place wasn’t packed. Just a group inside the resto and 2 girls outside the veranda. We were given complimentary bread and dip. The dips provided were pesto and salsa-ish tomato dip. It was good! 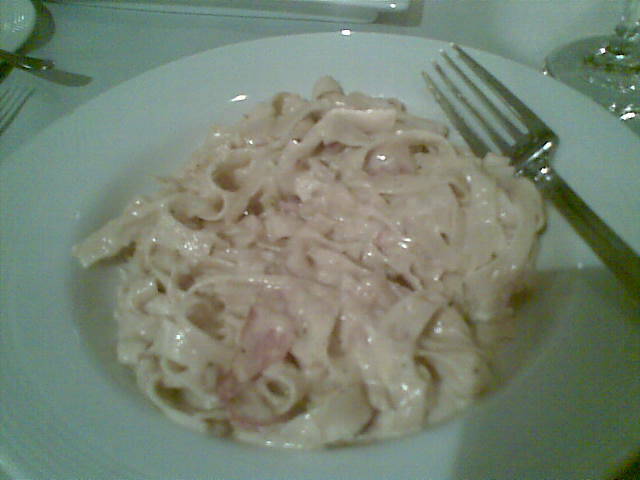 The Carbonara was creamy, with generous amounts of bacon & cream. No need for cheese. The noodles were superb, and i have a feeling it was handmade – the resto’s own recipe. and century tuna, in vegetable oil. the tuna’s vegetable oil used to saute the garlic and onions.